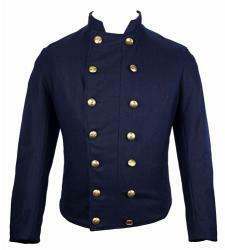 C&C Sutlery provides a full line of Shell Jackets for the Union Officer. We offer Single & Double Breasted Shell Jackets. Officer Shell Jackets are always lined. Second Lieutenant, First Lieutenant, and Captain wear a 9 button single breasted shell jacket. Major, Lieutenant Colonel, and Colonel wear a 14 Button Double Breasted Shell Jacket. A Brigadier General wears a 16 Button 4x2 Double Breasted Shell Jacket: 4 groups of 2 buttons per side. Major General and Lieutenant General wear an 18 Button 3x3 Double Breasted Shell Jacket: 3 groups of 3 buttons per side. 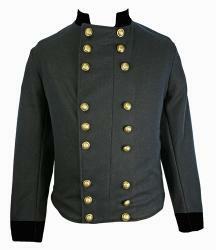 The General of the Army wears a 24 Button 3x4 Double Breasted Shell Jacket: 3 groups of 4 buttons per side. All C&C Sutlery Shell Jackets can be customized to meet your needs. In many cases, we can duplicate a SHell Jacket from a picture. If the options below don't meet your needs, call us 208-398-7279 to discuss your specific customization. The US Junior Officer Shell Jacket is appropriate for Second Lieutenant, First Lieutenant, and Captain. The C&C Sutlery US Junior Officer Shell Jacket is made from a finer grade, officer quality 15-16 oz broadcloth Navy Blue Wool. 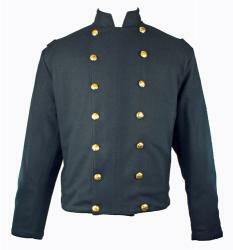 The Jacket is Single Breasted with a 9 Button Front of Federal Eagle Buttons. The Functional Cuffs are closed with 3 small buttons. The Shell Jacket is fully lined in Black or Brown Cotton lining and there is an inside breast pocket. This Shell Jacket is custom made specifically for you and is subject to a MINIMUM 20% restocking fee. Please allow AT MINIMUM 4-6 weeks for delivery. Click to read our RETURN and EXCHANGE Policy. The US Senior Officer Shell Jacket is appropriate for Major, Lt Colonel, and Colonel. The C&C Sutlery US Senior Officer Shell Jacket is made from a finer grade, officer quality 15-16 oz broadcloth Navy Blue Wool. 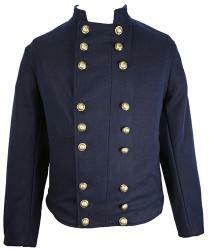 The Jacket is Double Breasted with a 14 Button Front of Federal Eagle Buttons. The Functional Cuffs are closed with 3 small buttons. The Shell Jacket is fully lined in Black or Brown Cotton lining and there is an inside breast pocket. The US Senior Officer Shell Jacket is appropriate for Major, Lt Colonel, Colonel, and General. The US General's Shell Jacket is appropriate for Brigadier General, Major General, Lieutenant General, and General of the Army. The C&C Sutlery US Shell Jacket is made from a finer grade, officer quality 15-16 oz broadcloth Navy Blue Wool. 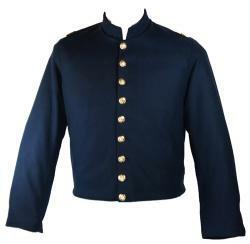 The Jacket is Double Breasted with a 16 Button Front in the 4x2 Brigadier General (1 star) Button Pattern (4 groups of 2 buttons per side) of Federal Eagle Buttons. The Functional Cuffs are closed with 3 small buttons. The Shell Jacket is fully lined in Black or Brown Cotton lining and there is an inside breast pocket.